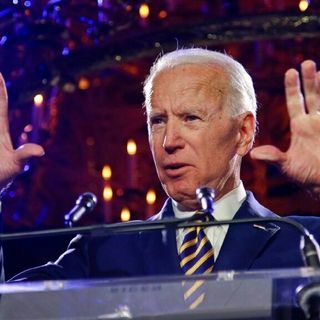 Three more women accuse Biden; Democrats target Trump's taxes #MAGAFirstNews with @PeterBoykin For more visit https://www.spreaker.com/user/peterboykin THREE MORE WOMEN ACCUSE BIDEN, SAY VIDEO ISN'T ENOUGH: If Joe Biden thought a video addressing the allegations of inappropriate behavior towards women would squash the scandal and enable him to focus on possibly launching his 2020 presidential campaign, he was mistaken ... Hours after he appeared on video to promise he'd be ... See More "more mindful" about others' personal space, three more women went public Wednesday to claim that the former vice president had touched them inappropriately. All three said Biden's video didn't go far enough. A previous Biden accuser, writer D.J. Hill, told Fox News' Shannon Bream on "Fox News @ Night" that she went public with her claim because she was inspired by other women who have come forward and the “cultural shift” that’s been “long overdue.” A total of seven women have now accused Biden of inappropriate conduct. SHOWDOWN OVER TRUMP'S TAXES BREWING: A key Democrat who heads the powerful House Ways and Means Committee has formally requested the IRS provide six years of President Trump's personal and business tax returns and the president has responded, "Is that all? Usually it's 10" ... The request Wednesday by U.S. Rep. Richard Neal, D-Mass., who heads the tax-writing House Ways and Means Committee, is the first such demand for a sitting president's tax information in 45 years. The move sets up a virtually certain legal showdown with the White House as Trump has refused the request, saying he is under audit. AOC reminds Trump in tweet about tax return request: 'We didn't ask you' VIRGINIA LT. GOVERNOR RELEASES POLYGRAPH RESULTS: Embattled Virginia Lt. Gov. Justin Fairfax on Wednesday released the results of a polygraph test he said he took in response to two accusations of sexual misconduct by two separate women ...“Today, I am providing the full report of my polygraph examinations to the media so that all Virginians can read the report themselves,” he said in a news conference held in his office, WTKR-TV of Norfolk reported. Fairfax again denied the accusations, saying, “they are incredibly hurtful to me and my family and my reputation, which I have spent a lifetime building.” Fairfax's two accusers, Vanessa Tyson and Meredith Watson, both spoke out in national interviews with Gayle King that aired on "CBS This Morning" earlier this week. STACEY ABRAMS STILL NOT CONCEDING DEFEAT: Former Georgia gubernatorial candidate Stacey Abrams questioned the legitimacy of her 2018 loss during an event in New York City on Wednesday, saying she refuses to concede the race to Republican Gov. Brian Kemp, while accusing the GOP of stealing the election ... "Despite the final tally and the inauguration [of Gov. Brian Kemp] and the situation we find ourselves in, I do have a very affirmative statement to make: We won," she told the crowd at the annual convention of the Rev. Al Sharpton's National Action Network. She lost to Kemp by more than 54,000 votes, but has repeatedly refused to concede the outcome.